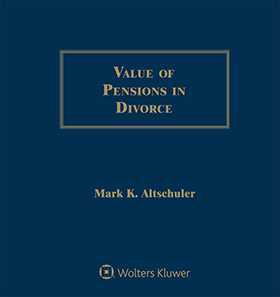 Value of Pensions in Divorce, Fifth Edition provides guidelines for financial advisors, divorce attorneys, and pension actuaries through every stage of the pension valuation process - from preliminary client interview to review of pension valuation reports, drafting of qualified domestic relations orders (QDROs), and cross-examination of expert witnesses. Mathematics are kept to a minimum, and legal principles and concepts of pension valuation are translated into plain English and illustrated with examples, sample court orders, and pension documents. Value of Pensions in Divorce includes detailed explanations and examples, as well as updates on standard topics. It introduces new approaches and new concepts relevant to everyday practice. It also offers practical applications of the values, allocations, and settlements of pensions in marital dissolutions. Loss of Benefits by "Phantom Benefit"
When Is a Deferred Vested Benefit a Pension Benefit?